Songbird Garden Series 1: Forever & Ever [W5077] - $9.00 : Yarn Tree, Your wholesale source for cross stitch supplies. Cross stitch pattern from Cottage Garden Samplings. Do you know someone who has an anniversary coming up? This design would be a great gift to stitch for them! 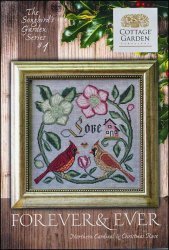 Two birds sit in the middle of this design with a home & "Love," stitched behind them. Look closely between the two birds & you will find a small heart. Love is "Forever & Ever." Stitch count 159w x 159h.